There’s not been much fanfare over this release, possibly to do with its timing around box office behemoths Godzilla and X-Men: Days of Future Past, but I really enjoyed this film from original Bourne helmer Doug Liman. It stars Tom Cruise as William Cage, an army major in the midst of a war with alien creatures known as ‘mimics’, who discovers that when he dies, he’s reset to the beginning of the previous day. This is not a new concept for science fiction, with films such as Groundhog Day and more recently, Source Code, using this plot device to tell a story, and whilst the idea isn’t original, it’s a hell of a lot of fun. Tom Cruise is experienced with these kinds of roles and his performance is as good as ever, with able support provided by Brendan Gleeson, Bill Paxton, and Emily Blunt as the female lead, Rita Vrataski, a renowned soldier. Emily Blunt’s a great actress, and she’s very good in a different type of role – it’s clear she’s spent time getting in shape for the part, and that really adds to the grit and determination that comes through in her performance. For a twisty time travel premise, the film does a good job of explaining its inherent logic, whilst also having fun with the ridiculousness of the idea. That humour is one of the film’s main strengths, and whilst we’re treated to some excellent action set pieces, the number of laughs help to elevate the overall quality of the film. 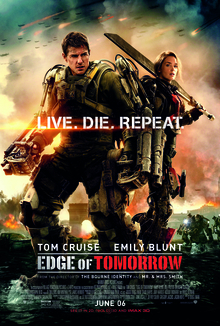 The film is very much reminiscent of playing a video game, where a player has to train up to get better in order to complete a level – in the case of Cruise’s character, the reset is his death and the save point is when he wakes up. It’s an interesting film in that respect, and one where video games have clearly had an influence on its format. Repetition is something difficult to avoid in a film with a resetting time premise, but Liman manages to keep things interesting by switching things up often enough and not repeating scenarios too much, with the previously mentioned use of humour working to good effect here. Overall, this is an excellent sci-fi action film and it’s well worth checking out.